That's right, they do exist - stylish sofas at smart prices. This list shows you that no matter your price point, you don't have to sacrifice style when it comes to sofa shopping! We've pulled together some of our favorite sofas that look great and don't break the bank. 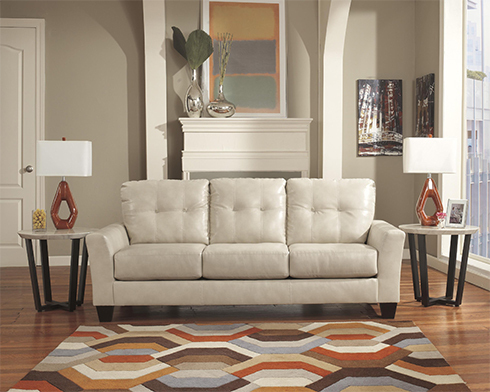 A contemporary style with sleek lines, this sofa offers a lot of look for a little price! Subtle tufted detailing creates some visual interest on this sofa's seat back and the tapered arms are a great change from the track arm you see so often. Another contemporary sofa, the Riley features a classic rolled arm and an exposed wood base across the bottom of the sofa. With a spacious seating area, this sofa is perfect for almost any sized home. The slate color is a great neutral that isn't just another tan or taupe! Enjoy clean lines and a sleek track arm in the one of our most popular silhouettes. Plus, we can't get enough of this new neutral hue for the body of the Zara Sofa. Every home deserves a grey sofa with fun pops of yellow. We love this sofa as shown - don't you! But, the Choices Sofa is available to customize too! Browse our online fabric gallery for the Belfort Basics brand or visit us in person to view all of your fabric options. Plus, you can change the arm on this sofa if you'd prefer a slightly different look. Try some unique for your home! This chesterfield style sofa showcases a tall back and traditional rolled arms. A classic look that never goes out of style, this chesterfield sofa has been updated to fit your modern day needs. This sofa is a triple threat; stylish, elegant and comfortable! Shown here in a soft grey fabric, this sofa is also available to customize. The sweet Charles of Londong arms flank this sofa and give it a classic appeal that's updated for you. No matter what your budget is, your living room doesn't have to suffer. Find a stylish sofa that fits your style and budget at Belfort Furniture. Browse online or visit our showrooms in Dulles, Virginia for hundreds of room settings filled with ideas and inspiration for your home. Let us help you create beautiful rooms for your entire home! Fill out our online Design Help Form here to tell us what room you're working on and your style - we'll get back to you with some great design options.